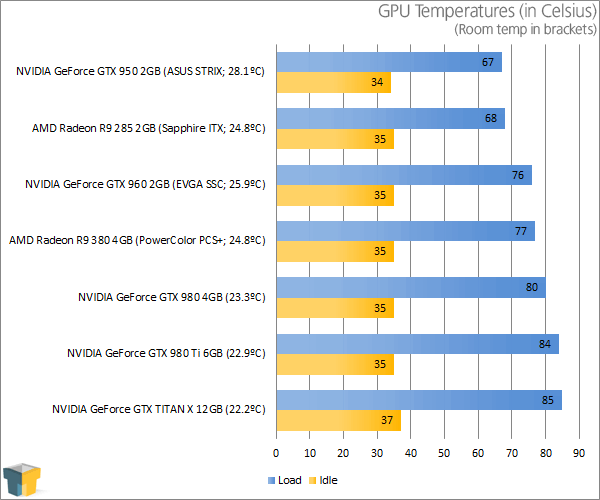 Despite performing better than the GeForce GTX 960, PowerColor’s PCS+ R9 380 manages to retain the exact same temperatures – of around 77°C. 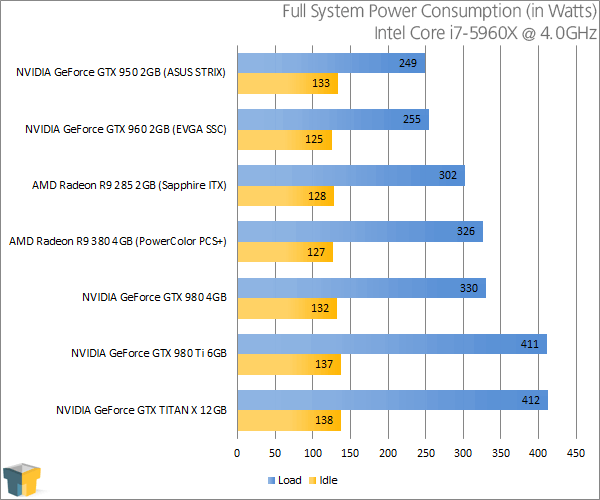 On the power front, there’s no competing with NVIDIA though, which shaves 71W off of the peak load of the R9 380. Let’s hope that AMD’s next generation proves to be a lot more power-efficient. 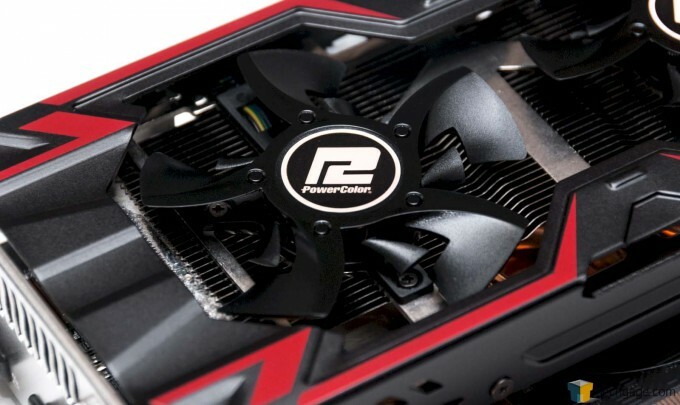 As I rambled on about at the start of this review, the process of reviewing PowerColor’s PCS+ Radeon R9 380 was the furthest thing from ideal. I ran into one roadblock after another, and as I see it, none of those were the cause of this card in particular. 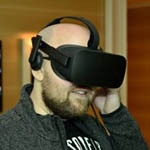 The biggest issues seemed to be a bunk DisplayPort cable that otherwise seemed fine, and then hassles with AMD’s drivers (which isn’t exactly a revelation). Admittedly, when the time came to actually benchmark this card, I was beyond flustered. I almost wanted to just ship the card back and say, “Sorry.” But, I’m glad I didn’t wimp out, because PowerColor has a great card with this PCS+ edition. As of the time of writing, the 2GB model of this PCS+ card runs $10 less than the least-expensive GTX 960 (also 2GB). Yet, it performs a bit faster in almost every single test. 3DMark put it at about 11% faster, even. It also manages to keep just as cool, which is nice to see, and gives some credence to the claim of the Double Blades fans being more efficient. Unfortunately, due to their design, these fans are a bit louder than most at higher RPMs. Lastly, it’s impossible for AMD to compete right now on the power front, and while I consider a 71W delta to be enormous, the extra power at least didn’t become a detriment on the temperature front. The 4GB model, as tested, costs about $220 as of the time of writing. Personally, I’d recommend sticking to the 2GB model if you are sticking with 1080p, and the 4GB model if you’re planning to go the 1440p route – and especially if you’re ever likely to buy a second card for CrossFire. Looking at it a different way, when this PowerColor card is compared to the EVGA SSC edition which had its test results in our graphs, both cards cost just about the same, at around $220. But, the AMD card offers 2GB more, and is a bit faster. NVIDIA’s perk right now is the vastly improved power efficiency and a free copy of Metal Gear Solid V: The Phantom Pain. Isn’t shopping for GPUs fun? Offers great 1440p performance with good visuals across most titles. PowerColor’s PCS+ cooling solution delivers modest temperatures at peak operation. A 4GB framebuffer is great to have if CrossFire is in the “cards”. The Double Blade fans do their job well, but at the cost of added noise.